This is one of 2 2006 Setra S417 Motor coaches we have available. 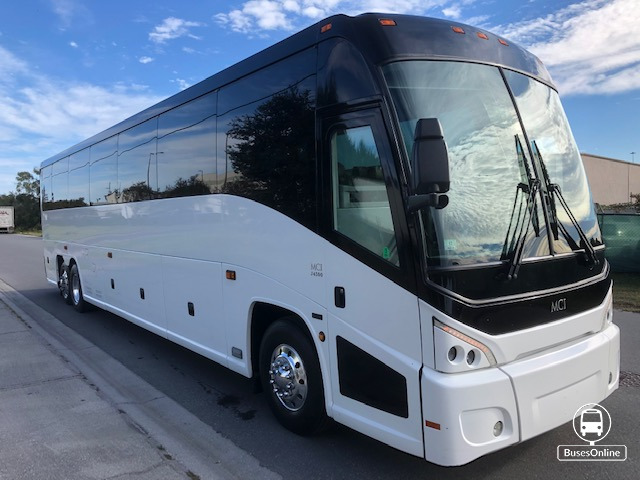 This unit 000381 has 401268 miles powered by Detroit Diesel Series 60 with Allison automatic transmission, 54 seat coach, DOT inspected, Video equipped, Heat and A/C System fully functional, these are southern coaches. 000382 388750 miles 54 passenger pictures available of all coaches please give us a call and we are happy to assist you. You are looking an a well maintained 2000 Van Hool C2045 with Cummins ISM Turbo Diesel Engine (rebuild in 2014) and Allison B500 trans. It has only 10237.9 Miles on Odometer, and features a rear restroom, spacious storage for cargo and luggage, and additional seats for up to 61 passengers. All tires (includes the spare) are in excellent good condition with new polished steel rims. Completely new white paint for the whole body (done in a month ago), new LED headlights, new rear back-light as well as the turn signal lights. Bus is also equipped with a 6 Monitor REI Video with DVD Player and a backup camera. Please feel free to contact me anytime by email: steven627@yahoo.com, Thank you for your interest! Beautiful 2003 SETRA S417 for sale. Excellent condition. 270,965 miles. Excellent addition to your fleet. L'Auberge Casino Resort Lake Charles 2002 Prevost Party Bus!!!!!!!!!!!!! Cummins Engine, Allison Transmission, Kubota diesel generator (20kw), Generator has 3526 hours, 5 cruise air conditioners and coach air, 200 gal black/grey tank, 200 gal fresh water tank , Price Negotiable!!!!!!!!! STRONG MOTORCOACH. NEW UPGRADES. READY FOR USE!! 2011 Van Hool C2045. Cummins/Alison combo with 110v outlets throughout. Keep your passengers safe with the factory equipped 3 pt. seatbelts. Newer paint, well maintained and ready to work! This coach shows exceptionally well. Pride of ownership is obvious with this gem of a pre-owned C2045. Inquire today! AVAILABLE NOW: Very clean '01 Van Hool C-2045 standing tall and ready for work. Setra 417 The bus is 56 passenger. Bus has outlets, Lavatory, 5 monitors and PA system We have replaced the starter, air dryer, Belt tenssionner, starter, air drye,r and fuel injector. The bus also has back up camera, laminate style flooring. It has beautiful Gold color exterior and clean interior seats. 2007 Prevost X345 luxury motorcoach 44 passenger - mileage 700,000 Detroit Diesel Series 60 Engine ZF AS Tronic Transmission Luxury black leather seats with WiFi, charging ports, cupholders, seat trays, business class seating with extra legroom, magazine/beverage station in rear. Super clean, well maintained. Vehicle location - Long Island, New York.